The multi-cultural and lush state of Chiapas is home to 12 of the 62 indigenous groups officially recognised by the Mexican government. 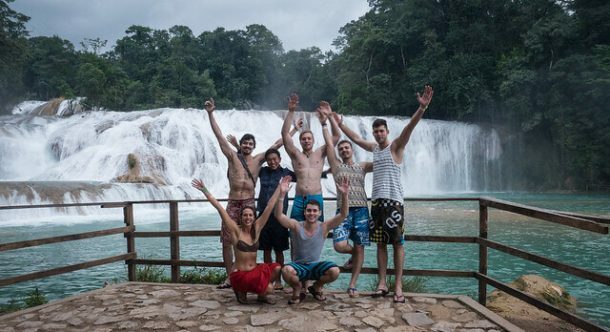 From the beautiful ruins of Palenque, the bright aqua waterfalls of Agua Azul, Christmas Tree Falls and epic canyons. Chiapas is where you come to see Mexican culture at it’s strongest. Where indigenous traditions coexist harmoniously with old Spanish ones, and Mexican customs thrown into the mix as well. Tuxtla Gutierrez is probably the biggest city you’ll find in Chiapas. Though it’s not much on the eyes, it is the gateway to visit Christmas Tree Falls and Cañon De Sumidero. 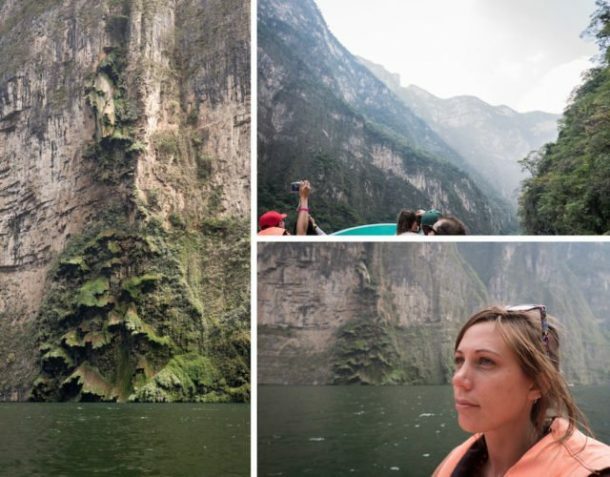 Sumidero is a beautiful canyon accessed only by boat, where you can see monkeys, crocodiles and bird life. The main event, Christmas Tree Falls, is a waterfall shaped by mosses as a Christmas tree. It is perhaps better to see these falls in the wet season, as I went in the dry and there was almost no water at all. Since it’s only an hour from San Cristobal, most people choose to stay there instead of Tuxtla. But Tuxtla does have great cheap food and a bustling local nightlife if you do want to check it out. There are many tours that pick you up right from your hotel door that cost around 300 pesos ($30 USD). Very cheap, but there is a cheaper way as well, I’ll explain below… Bookings can be made at your hotel or any of the tour agencies in town. We caught a colectivo to Chiapa de Corzo (30min) for 12 pesos. You can get this colectivo from Avenda Central Oriente in Tuxtla. If you are coming from San Cristobal you will have to change colectivos in Tuxtla. Once in Chiapa de Corzo walk through the market square of Fuente Colonial and head down the hill down 5 de Febero Street towards the river. On the waterfront you can purchase Boat ride tickets direct to Sumidero at Embarcadero Chiapa de Corzo for almost half the price (160 pesos). Total cost is 184 pesos return to Tuxtla. El Casa de Jardin Hostel: ‘The House of the Garden’ was a lovely, quaint hotel close to the centre of town. Some rooms feel like you’re staying in a treehouse! Dorms from 120 pesos ($12 USD). Tuxtla to San Cristobal: There is the Omnibuses running between San Cristobal and Tuxtla, leaving every 20 minutes and only cost 40 pesos. Tuxtla to Mexico City: There are a couple of overnight buses running between San Cristobal and Mexico City that stop in at Tuxtla. These are on Cristobal Colon Buses, which cost about 300 pesos and take around 11 hours. Otherwise, the ADO tourist bus is 800 pesos for the same trip. The narrow cobblestone streets and brightly coloured buildings of San Cristobal will draw you in the minute you step foot there. Situated in a fertile valley, surrounded by mountains the crisp air and cool weather make for a welcome break from the sweaty coasts. The indigenous people of Chiapas speak their own language and practice their own customs, which are an interesting mix of Spanish colonial and Indigenous Mayan. Just out of San Cristobal in Juan Chamula sits a church where worshippers smoke, drink and sacrifice chickens inside its walls. Juan Chamula: As you approach the Church of St John the Baptist, worshippers can be seen wearing traditional outfits, playing music and singing loudly. Once you step inside, the atmosphere changes to a place of intense concentration. Scattered pine needles lay on the ground covering splatterings of candle wax and sacrificed chickens. Families sit for hours drinking, eating, smoking and praying. Only once all of the snacks and alcohol have been devoured are the families supposed to take the dead chicken home where it will be cooked into a dish that everyone shares. Na Bolom Museum: One of San Cristobal’s hidden gems, Na Bolom was originally built inside an old monastery but was turned into hotel, museum, research centre and tree nursery for jungle restoration. The museum is filled to the brim with historic artefacts, including those of the legendary Lacandon Maya tribe who were the only tribe that were never conquered by the Spanish. Bolom is Mayan for Jaguar, which live in the Chiapas jungle. Walk the streets: The cobbled streets, eclectic display of cultures and outfits, brightly coloured buildings and Spanish architecture makes wondering around San Cristobal a photogenic experience. Casa Na Bolom: This is the same building as the museum and definitely an experience to stay in. 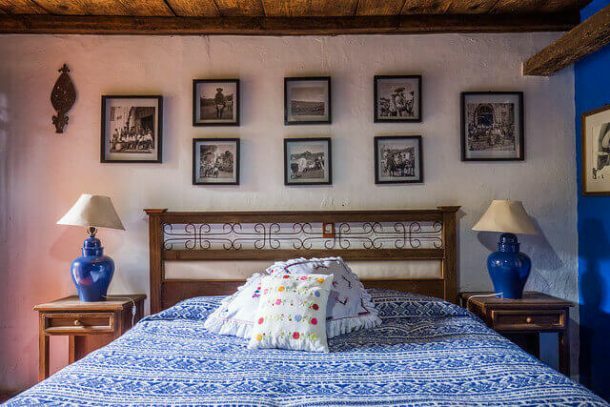 Each room is intricately decorated with antique furniture, elaborate artwork from local artists and museum artefacts. If you’d like to stay in the same place as the likes of Henry Kissinger or Diego Riviera, then stay in this not-for-profit hotel. Puerta Vieja Hostel: In the heart of the city centre, this neo-classic building is modernly refurbished to accommodate any backpackers needs. Big comfortable beds, spacious outdoor area, a bar with a fireplace and FREE COCKTAIL FRIDAY. Yussss. Maya’e Restaurant: For slow-cooked pork and fried fish for only 60 pesos. Puerta Vieja Hostel: Has a great bar with loads of backpackers around ready for a drink. Did I mention the Free Cocktail Friday…? Tuxtla to San Cristobal: There is the Omnibus running between San Cristobal and Tuxtla, leaving every 20 minutes, which only costs 40 pesos (and then another 6 pesos for a colectivo into the centre of town). San Cristobal to Mexico City: There is also a couple of overnight buses running between San Cristobal and Mexico City on Cristobal Colon Buses, which cost 300 pesos and take about 11 hours. Otherwise, the ADO tourist bus is 800 pesos for the same trip. San Cristobal to Palenque: To get to Palenque, the ADO bus is 130 pesos and takes 5 ½ hours and runs during the day. There are also colectivo’s which stop at the waterfalls and ruins along the way. Palenque was hands down one of my favourite places in Mexico, and easily my favourite in Chiapas. Surrounded by breathtaking lush rainforest and scattered with limestone build-up, aqua-green-filled waterfalls to find and explore. This cultural and historical UNESCO heritage site wonderland also includes Palenque Mayan Ruins, buzzing with tourists and archeologists all marvelling at this important structure. Palenque Ruins: Upon arrival at the ruins you will stumble into a large step pyramid named “Temple of Inscriptions’ due to the hieroglyphics scrawled over the walls. As you wander around, each temple provides a different setting and meaning, and it’s a fantastic day out. Entry cost is 57 pesos flat rate. Roberto Barrios: This was possibly my favourite cascades in Palenque! It is not on the main tourist trail so it wasn’t as busy and the place was just a water wonderland. You can climb, jump and swim all over them and they go on and on for ages. There was one tour group there using strips of plastic to ride down the falls which looked super fun! This gem is well hidden, so be sure to learn enough Spanish to ask where “Las Cascadas” are once dropped off in the tiny town. Entry to the falls is 20 pesos and the return colectivo is 55 pesos from Palenque town. 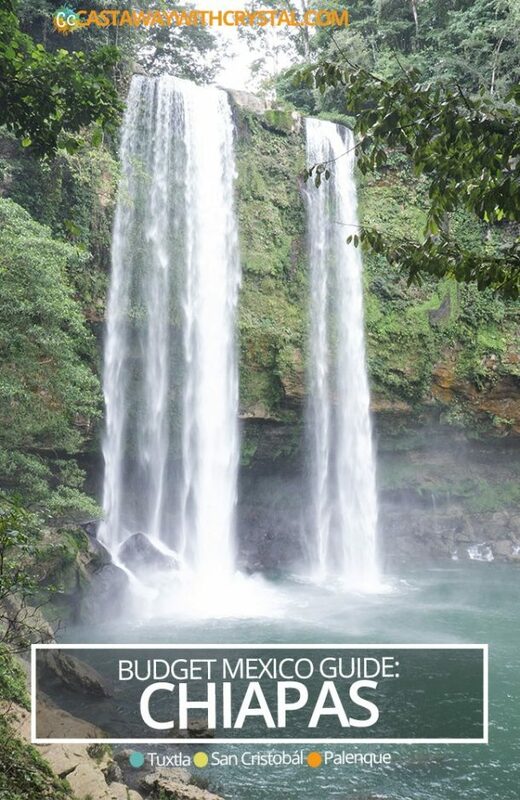 Misol Ha Waterfall: A huge waterfall drop of 100m located in the surrounds of Palenque Ruins (so you could do both of these in one day). You can stand on the rocks under the rapid water (if you’re game) or swim in the pool underneath. Next to the waterfall is a cave that you can explore if you have a torch as well. Entry 30 pesos, colectivo 35 pesos. Agua Azul: Probably the most popular of all the cascades, is a busy touristy area filled with food hawker stalls and other useless stuff. DO NOT let this put you off though. I had so much fun in Agua Azul, so much fun in fact that I nearly drowned in giggling exhaustion. If you want to head straight to the adventure, ditch everyone and head all the way to the top of the falls until you run out of paved track. Dump your things and swim across to the opposite side of the falls where there is a slight current. Now let the falls take you. You will float to the top of the first falls where you can scramble and jump up, around and down the falls until you can’t find a way down anymore. There’s a rope swing, lookouts and tracks along the way. It is just so much fun there! 39 peso entry fee and colectivo is 35 pesos. Yaxkin Hostel: I was initially drawn to this hostel due to its huge and bountiful garden. And it did not disappoint. All the rooms are semi-secluded in the epic garden and are huge. The kitchen is large and in a communal area making it easy to make friends, and you can BYO drink anywhere you like. There are also yoga classes on site and free Internet #winning. Basic dorms are 135 pesos per night. Getting around Palenque is easy. There are a series of stops in the centre going to all the different tourist destinations and the trips are cheap. Ask your hotel for a map. Palenque to Cancun / Isla Holbox: Where Palenque is located, I thought getting to Isla Holbox or Chichen Itza from Palenque would be easy, but it’s not. You have to divert back to Cancun first which adds on a little bit of extra time. There is an overnight ADO bus to Cancun that costs 250 pesos. Palenque to San Cristobal: The ADO bus to San Cristobal takes 5 ½ hours and costs 130 pesos. It only runs during the day. 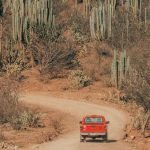 Cheap Accommodation: Mexico and especially Chiapas, has a strong CouchSurfing scene that I highly recommend you try, even if it’s just to meet locals. I’ve met some great people and only had positive experiences! Speaking Spanish: You won’t NEED Spanish in touristy areas in Chiapas, but if you want to make the most out of your travels and also get the local prices on buses, etc, I suggest you spend some time learning Spanish. You can take private lessons all around Mexico for as little as $5 USD an hour. Just ask your reception for a tutor. If you found this information useful, share it for others to see! I see why Palanque is your favorite. It is quite evident from the pics that this a chilled out place. I can’t get over that waterfalls. Amazing spot !!! I haven’t been to this part of Mexico yet but it looks stunning, particularly that waterfall! Thanks for this post. 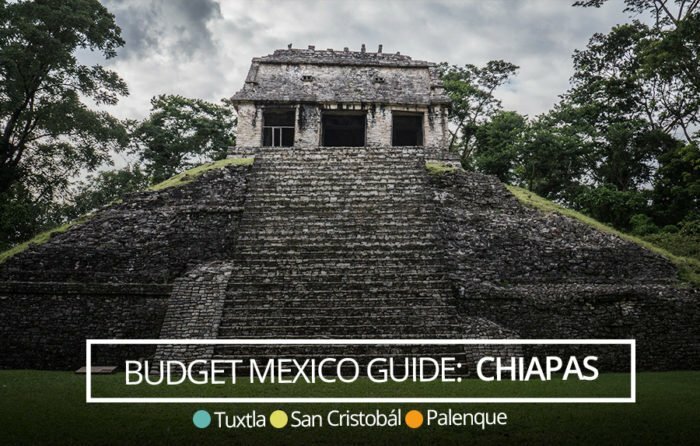 The days of my budget travel are over but I grew interested in this as my wife and I wanted to go to Chiapas to food trip as I’ve heard incredible things about the area. Any favorites? The way you Palenque makes me want to jump on a plane now. I haven’t done tons of research but looks like I’ll have a start after this post! 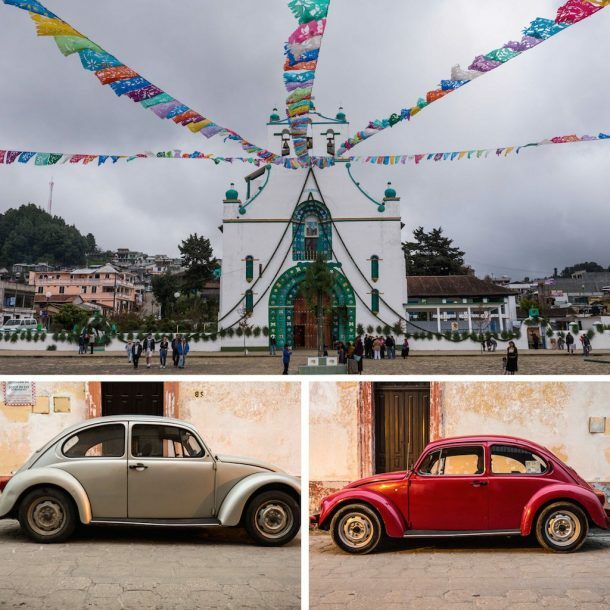 I’d never heard of Chiapas before your post – and it sounds like an amazing place. The contrasts between the scenery and the city streets are great, it sounds like a destination with something for everyone! I am so in love with Mexico. Thanks for sharing this beautiful part of the world. Palenque is definitely on my list now. Thanks for sharing this, there’s so much of Mexico I have no idea about, but it all sounds amazing. San Christobal looks so pretty, I’d love to visit! very nice article! 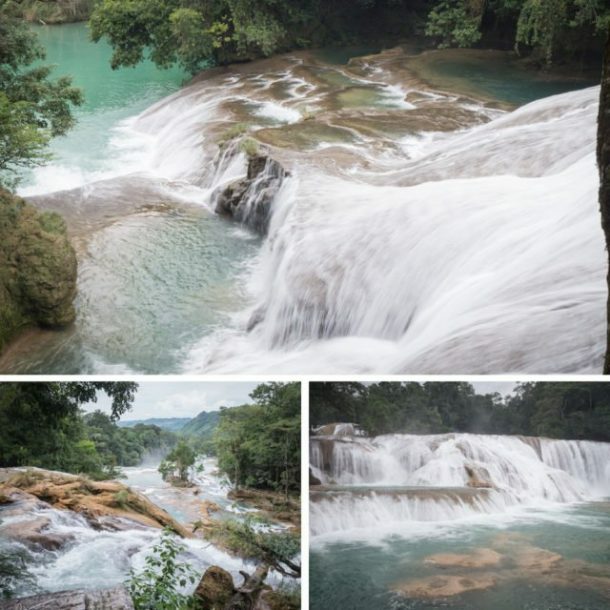 I have never been to this Chiapas while I was in Mexico for a week, but I should have, Seems very cool! I wasn’t aware that I can visit Mexico on a budget, Crystal! Such an informative and inspirational post!